Submit Your Photograph and Story! This time we were going in just for bloodwork but we have been visiting the children’s hospital since he was a newborn. He has several medical conditions including FPIES (food protien induced entercolitis syndrome which is like delayed food allergies) Autism, and had a Chiari Malformation decompression surgery last August (part of his brain was sitting in his spinal column). 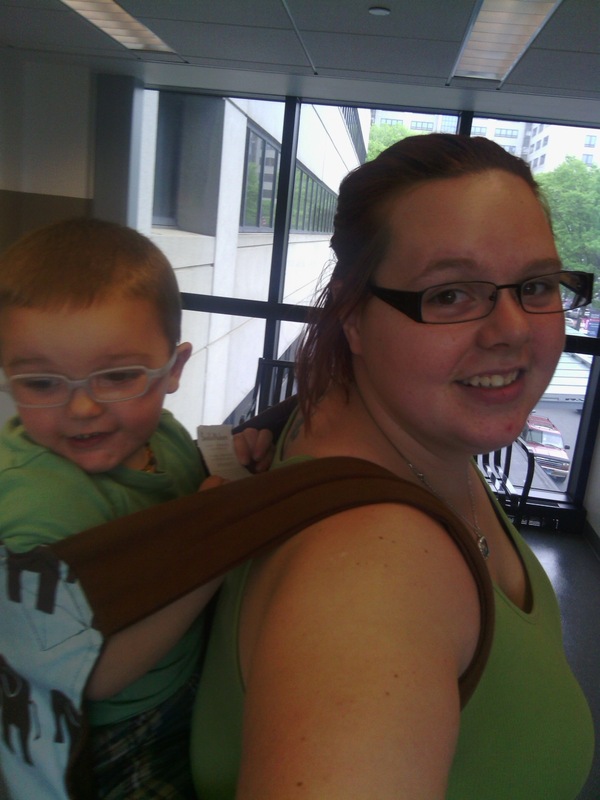 I needed to babywear because he was so sick as an infant but couldnt afford a “real carrier” so I started making them after he outgrew his Moby. I use a DIY linen wrap, a dyed osnaburg ringsling, and made several half buckles, this one being preschool sized and have made several mei tais for family members. It is much easier to throw him on my back for a quick appointment than it is to take out the stroller. Also, I always get questions from curious parents while I’m there!